A long time ago, in what seems like another lifetime, I lived in San Francisco and worked for an insurance company. My job was to process group insurance claims, medical and life. I remember that a particular claim had me stumped for a while. A husband and wife had crashed their private plane in the mountains of northern California. Both were dead when the searchers found them, and no one could determine the order of death, or, in colder words, which spouse's contingent beneficiary was to receive all the life insurance money. 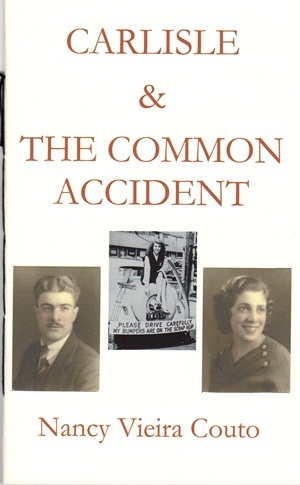 Fortunately someone dug up a little-known law under which, when a man and a woman die in a common accident, the man is presumed to survive the woman. I don't believe this “ladies first” rule is still in effect, except possibly in Louisiana. Fast forward a couple of decades or so. I was struggling with a poem called “The Common Accident,” a difficult poem for me because it dealt obliquely with my aging father's deteriorating health. At around the same time, I was fooling around with dBase III on an old DOS computer. I knew nothing about programming, not really, but I was working for a university press at the time, and, because I needed a database to track subsidiary rights sales, I was spending an hour or so each day working out menus and submenus to take me from the specifics of a published book to its possible other incarnations in various languages and bindings. The menus and submenus were what fascinated me. I saw them as a series of roads to take or not to take, signposts suggesting real and imagined choices. I started playing with “The Common Accident,” spinning lines off into other poems that I called “polychotomies,” going for something messier than a dichotomy, something unpredictable, sort of like life. What I wanted was an open-ended structure that would allow me to generate poems out of details of personal or family history and to link them in unexpected sequences. When the series threatened to sprawl out of control, I wrote “The Accidentals,” which is composed entirely of phrases from the poems that precede it, in an attempt to pull everything together, sort of unlike life. As for Carlisle, she just happened. She is tougher and braver than I am. But the butterfly was real. very careful not to watch too closely. Nancy Vieira Couto's poems have appeared in numerous magazines and anthologies, including The Iowa Review, Mississippi Review, Prairie Schooner, The Southern Review, and Good Poems, American Places. Her book The Face in the Water won the 1989 Agnes Lynch Starrett Prize from the University of Pittsburgh Press. Her other awards include two National Endowment for the Arts Fellowships, a Creative and Performing Artists and Writers Fellowship from the American Antiquarian Society, and a Constance Saltonstall Foundation for the Arts Grant. She was born in New Bedford, Massachusetts, and now lives in Ithaca, New York, where she is poetry editor of Epoch.